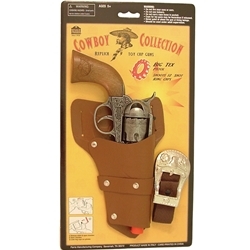 Big Tex Gun & Holster - The soft vinyl holster and belt has the look and feel of leather. The pistol is made of die-cast metal that looks just like antique metal and can fire 12 shot caps. Length: 11". Belt fits up to a 32" waist.